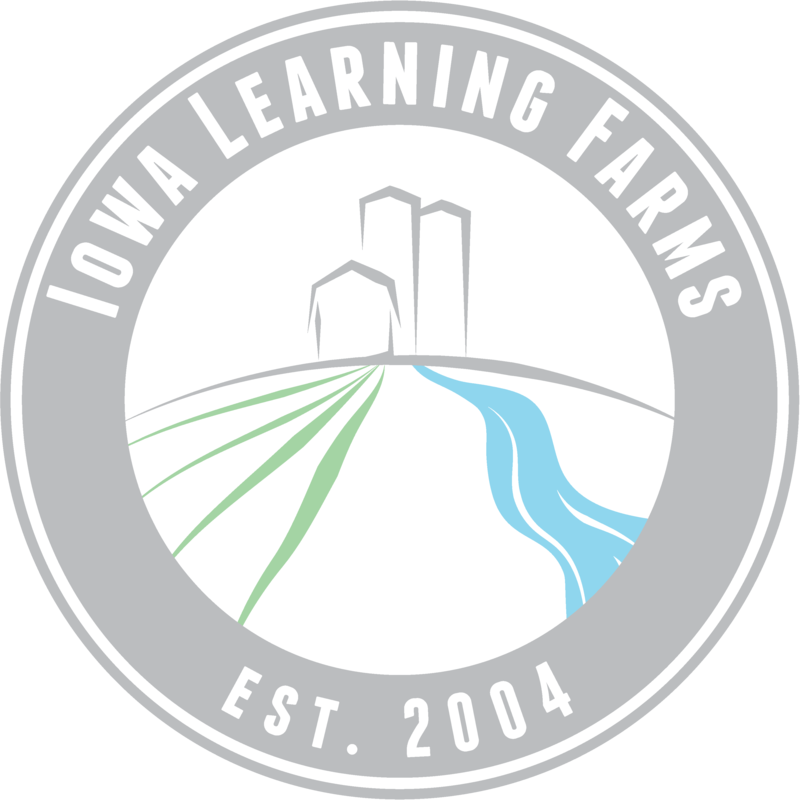 We are thrilled to share the news that one of this year’s Spencer Awards for Sustainable Agriculture is being awarded to Clarinda-area farmer Seth Watkins, long-time farmer-partner and friend of Iowa Learning Farms! The Spencer Award recognizes researchers, teachers and farmers who have contributed significantly to the environmental and economic stability of the Iowa farming community. Nominated by fellow farmer-partner Nathan Anderson, Seth Watkins is one of the most forward thinking, creative, and innovative farmers you’ll meet. He is dedicated to learning all he can about improving the water and land under his care. How he treats the land and how he gives of his time demonstrate both his conservation-focused stewardship and his incredible generosity. Watkins’ crop and cattle enterprise, Pinhook Farm, is a little slice of paradise in the rolling hills of southwest Iowa, featuring rotational grazing, restricted wildlife areas, riparian buffers, ponds, wetlands and shallow water habitats, integrated pest management, prescribed burning, windbreak restoration, no-till, cover crops, terraces, prairie restoration/CRP, late season calving, and prairie strips. He sees no conflict between profitability and environmental sustainability. Watkins is a big-time conservation and systems thinking advocate, sharing that message on the local, state, and national levels. In addition to hosting a two-day Emerging Farmers retreat on his land with Iowa Learning Farms, Seth has been willing to be interviewed by a dog for the “Adventures of the Conservation Pack” video series, participated in ILF Leadership Circles and hosted both farmer field days as well as elementary school field trips on his farm. Seth teaches through example and he is kind and patient regardless of his audience. His creativity, compassion and willingness to help others make him stand out in a crowd. Read more about the Spencer Award and this year’s winners in the news release Leopold Center at Iowa State University Presents Spencer Award for Sustainable Agriculture. Join us in congratulating Seth – we couldn’t think of a more humble and deserving farmer! On behalf of the Leopold Center for Sustainable Agriculture, we encourage you to submit a nomination the 2018 Spencer Award for Sustainable Agriculture. For the past 17 years, we have been pleased to work with the Spencer family to present this award to deserving Iowans in agriculture. Many of the Spencer Award winners have been farmers who were shining examples of how to use a variety of conservation practices to make their land and operations more sustainable — and leave the land in great shape to pass on to their families. Past Spencer Award winners include an ISU agronomy professor, an extension educator, a research farm manager and a USDA scientist who has been a pioneer in cover crop research and promotion. What they ALL have in common is a desire to improve Iowa’s landscape, albeit in very different ways. Some lead by example, showing their fellow farmers what will work on their land and how. Others have promoted local food production, organic farm products, or sustainably raised livestock. Some work in the field, others in the lab and still others offer education and mentoring to their peers. If you know someone who fits into any of these categories (or you are such a person), please consider applying for the 2018 Spencer Award for Sustainable Agriculture. Please submit the nomination using this electronic form, either as a paper copy mailed to the address below or as an electronic document emailed with Spencer Award in the subject line, to me by June 16, 2018. Read a tribute to Norm and Margaretha Spencer. Learning about the Water Cycle – Across the Ocean! During the first part of January, I had the opportunity to travel abroad before returning to the Water Rocks! team. As part of a lifelong dream realized, I took a class with the University of Iowa, called the India Winterim trip, and my section was focused on Water Poverty in Rural India. The class combined my favorite place on Earth (India) with my favorite topic on Earth (water quality). As an added bonus we had the opportunity to learn about strategies for dealing with saline soils from some of the smartest scientists in the field. Our class partnered with an NGO called the Sehgal Foundation, a group who is doing a lot of work with rural communities in the Nu district (formerly the Mewat district) near New Delhi. While our class was there we had the incredible opportunity to help Sehgal do some wider scale sampling and design work with them. Our team included Sehgal scientists, engineers and volunteers along with University of Iowa students and professors. Sehgal serves as the Extension and Outreach department for this district and many others. They educate people on sustainable farming practices and seek to improve water quality for drinking and irrigation purposes. Drip irrigation in a test plot by the Sehgal radio site. Our team during the debrief of our tasks for the class. Photo courtesy of Amina Grant. I was excited to go out in the field and collect data because with a background in Environmental Science, I felt like I would be the most useful outside. I also wanted to be out in the 70 degree weather! Our class exploring our site for the first time next to the Aravali Hills. Being out in the field, I had the opportunity to work with Sehgal water monitors to locate sites and take water salinity samples. Sites were often a bit of a scavenger hunt as wells run dry during the years we are not there or become dysfunctional for a variety of reasons. We worked with the local water monitors to line up our sites to the ones they had been using as best as possible. Then we used a tool called the Solinst to measure water temperature, conductivity and depth. Me, using the Solinst to take readings. Photo courtesy of Amina Grant. We went out to the field on three different occasions. My classmates and I worked to efficiently sample as many sites as we could, while making sure we were being accurate about the sites we were testing. It really tested my coordination skills to try and pay attention to what everyone was doing and end up with usable data. I definitely gained some skills in data management because along with my conductivity readings, my friend and classmate Amina Grant had to collect her own samples and that required an entirely different set of numbers to be recorded. Amina found a Daphnia (small water creature) in one of the wells she was testing. We were hoping our measurements would add to the body of knowledge Sehgal and the local volunteers have been building about the water over time. We understood that our measurements were only a small piece of the puzzle, but hopefully some answers can be gained as a result of our cumulative efforts. Sehgal test plots provide alternative methods for sustainable agriculture in the region. In the back, you can see the drinking water filtration system. The water challenges in the Nu district are different than ours because their main problem is poor water quality and soil quality due to salinity. But the same principles of hard work, long days, and an interdependency on the water cycle bind across oceans and cultures. Conservation Gone to the Goats! As a dog owner, I’ve covered a lot of miles with my Siberian Husky walking the streets, sidewalks and trails of west Ames. However, one of our special adventures is taking a short road trip out to Ada Hayden Heritage Park on the north side of town. It’s just a few miles away, but visiting this urban park gives the feeling of a great escape when you’re immersed in the sights and sounds of the prairie, oak savanna, and wetlands surrounding the lake itself. Wildlife sightings are always exciting out at Ada Hayden, and the changing seasons bring a plethora of unique insects, reptiles, amphibians, and waterfowl to the park. On our most recent visit, we were excited to stumble upon a different animal we hadn’t seen out there before – goats! A new herd has taken the park by storm, and it’s all in the name of conservation! Along the south side of the lake, a herd of 40+ goats, provided by Goats On the Go, has taken up temporary residence in a 3.5 acre area. The goats were brought in specifically for the purpose of targeted grazing, clearing out low brush and managing invasive vegetation in the oak savanna area. Targeted grazing with goats offers many benefits – including reduced use of herbicides (and the associated challenges of herbicide resistance), reduced need for mowing, and their ability to work in rough terrain with minimal risk of erosion. The goats are fenced in to ensure they are grazing the correct targeted area, and they typically spend 4-7 days per acre before being moved. The Goats On the Go website says it best: Goats go where people can’t, eat what most animals won’t, and leave behind nothing but fertilizer. How do the goats know exactly what to eat? The goats are not specifically trained to eat certain plants and avoid others. It just so happens that quite a few common nuisance or invasive species are to be some of the goats’ favorite delicacies, including honeysuckle, poison ivy, wild parsnip, buckthorn, garlic mustard, thistle, ragweed, mulberry, and more. The goats will also eat some grass, but when the above species are present, the grass comprises a pretty small portion of their diets. The City of Ames is in good company with its use of targeted grazing. Goats are gaining traction across the country as excellent mob grazers, from airports (Goats, Llamas and Sheep Make Up Landscaping Team at Chicago’s O’Hare International Airport) to golf courses (Grazing Goats To Help Prune SF Presidio Golf Course’s Bushes, Lawns) and business campuses (check out the Goats of Google!). SO, bring on the goats! It’s quite the show, and ALSO an excellent practice when it comes to land management, invasive species control, and conservation. In addition to the goat spectacle, the prairie is ablaze in color out at Ada Hayden, as well. I’ll leave you with a selection of snapshots from our adventure exploring the prairies and wetlands, and the lake as well, on a gorgeous July day.